Two points wasted. Not a great match to watch especially in the first half, nevertheless Roma were in control, Genoa hardly able to stop the Giallorossi pushing forward, eventually with El Shaarawy opening the scoring. Thereafter not much trouble until madness happened. Madness Daniele De Rossi. In the middle of Roma penalty area with nothing happening he decides to pull the shirt of Lapadula causing a silly penalty, then to make the matter worse he slaps him in the face, forgetting about the hundreds of CCTV cameras and the VAR system in place to detect anything these days. Result: VAR showed it was a clear penalty and a red card for De Rossi, with Lapadula scoring the equaliser. Then, a ten-men Roma nearly won the game denied by another crossbar by Strootman at the end.. Shick found space with 5 mins to go and showed great skills. But in the end, 3 points thrown away. We need a balanced assessment: while we agree that De Rossi silly move cost Roma 2 points, we also agree he’s had too many similar incidents in his career. So, no doubt he should be punished but cannot be classified as the evil figure of this football club. DDR remains DDR, with his pros and cons, nevrtheless a symbol of AS Roma. Time to reflect but move on. We have SPAL on Friday and then Qarabag next week. Cannot afford any more distractions. Daje Roma! This is the choreography displayed last night in the Curva Sud. “We are the Urbe,” we are Rome and Roma. And so it was also in the field, a superiority demonstrated during 90 minutes, culminating in the goals of Diego Perotti and the incredible Radja Nainggolan who did not even have to be in the field due to injury. That being said, Lazio appeared as a fearsome team, according to the standings this year and the losses suffered by Roma last year in Coppa Italia. But this team under Eusebio Di Francesco believe so much in his own means and capabilities. Lazio counter-attack was limited and put under control for most of the game. Roma played well and only conceded field in the final minutes due to Manolas causing a silly penalty that reopened the game when you did not expect it. Roma was 2-0 up and in full control but suddenly Lazio found itself back in the game with 15 minutes to go. At the end, everything went well, fine as it left unscathed the result and the performance, always composed, without giving too many signs of panic. So, Roma wins the Derby, surpasses its cousins in the table, and takes three key points that keep the chasing alive and kicking. Napoli remains in the lead after winning in Milan, but closer to Juve today losing to Sampdoria. The samew Samp team that we will soon have to face for the game in hand. What matters in that we are now sure we have a solid team that will compete until the end. Champions League next: On Wednesday we go to Madrid, and we will be there, too. We are in a heady position but we do not want to hear about defeat that we can stand with the Atletico, then we take three points with the Qarabag. We bet that Di Francesco thinks it the same way. Daje Roma! “What can you say? Nobody could ever imagine such a turnaround, from 0-1 down to a 3-1 victory. A win against on-form Juventus, only dominant ruler of Italian football for the last 6 years, who had recently crushed Barcelona and Monaco, soon meeting Real Madrid in the Champions League final. Last night there was every reason to think things were again going their direction. Nobody could think the unthinkable. On any other night, Roma would have just rolled over after Lemina’s goal, but this time they kept right at it, kept pushing the ball forward to Salah and El Shaarawy, worked as a team and did not lose the plot. The new-old formation upfront, Salah, Perotti, El-Sharaawy looked more cohesive, whereas with Dzeko alone you felt more sense of isolation and disjointed attack plans. At the back, Manolas, Fazio and especially Rudiger looked more attentive. Szecesny was superb on a couple of occasions. Nainngolan, De Rossi and Paredes were just on top in midfield. DDR was the real gladiator last night, encouraging the team to go and win the game. So, a big win last night. Juve were denied to win the title at the Stadio Olimpico. But will almost certain win the Scudetto next week. Roma earned vital 3 points to keep Napoli behind, with two games to go. Spalletti did well last night, and Totti came on with only 2 minutes to go. At this stage, we are concentrated to secure second spot. That’s all. Daje! Forza Roma!”. “Spalletti is right. Pallotta is right. Our primary goal is to finish in second place. But now third place will do just fine. This is the result was exiting the CL preliminaries with Porto, in Europa League with Lyon, in the Italian Cup with Lazio. With Scudetto gone, which is better than a second, or even third place in a three-league championship? In short, everything does broth. The same good broth with last night’s victory against a Milan at the very bottom end ever. The Rossoneri have just the name left. However it is a victory that brings Roma to +1 on Napoli, but with the pitfalls of the next round, we at home with Juve and they are in Turin with the Granatas. Victory but not without controversy. Spalletti defends his job and defends his choices, of course. A quick summary: last year, great work, Spalletti regenerates the team from Rudi Garcia’s last shambles, then in the last days of the championship he won third place also thanks to the 4 goals of Totti first outcasted and kicked out of Trigoria, then put back into play. This year Roma were kind of favourite but soon goes out of the Champions League, a great championship until February, then the light suddenly turns off and goes out of all the competitions. Bad games with Lazio in the Cup and in the championship. Out of the Scudetto fight and sucked in back by Napoli for second place spot. But hearing the technician now also the third place is not to be thrown away. Well. How do we judge this season? Third place definitely a fail. In a three-time championship, you would be the last one. The second place would be disappointing, given the initial goals for the three competitions. But all in all, recyclable. Now this other chapter: Spalletti mysterious games on its future, fighting with journalists, change versions and thoughts; now also does same as Franco Baldini “but where I am now”. The Club announced that Totti ends here, but Totti does not confirm. That’s how the rips season started. But it’s all right. Spalletti is not obliged to play Totti or play it just to get him applause at 5 minutes from the end to the result obtained, with the crowd chanting his name in Milan. But it’s okay. This is done for Roma, for the result and for the goal of the second place. But then they do not tell who came on in the field as replacement. Not a phenomenon, but Bruno Peres who did not deserve to play even half a second, considering the disasters he’s done this year. Even Spalletti realized that, a little later but at least he was understood at the end. But now to get Peres on not only in place of Totti but also of anyone else on the bench yesterday, it’s just a slap in the face, nothing more. We’re not stupid, Luciano. Then let’s see what Totti will do and see what Spalletti will do. Surely their roads will be divided forever. If Totti becomes a Roma Director, Spalletti will no longer be the coach, and vice versa. But then we don’t care really. Roma comes first, right? We read and heard: “But did you see how Juve handle their players, we want to be like them. Del Piero was driven out; we need to do the same with Totti. Totti is the ruin of Roma”… by Romanist fans. That is, the strongest player in Roma’s history is not a problem; it’s even a ruin. “We will never be at the Juve levels until Totti remains”. Meanwhile, Juve when he fired Del Piero signed Tevez, not Destro, and then the various Higuain and Dybala to follow suit. Juve can boast Scudettos, trophies, and great players, but us instead? If I bring 6 championships in a row, cups and Champions League finals, normal that a Juve fan says “Del Piero? Pogba? Who cares? But us? Where are our trophies? We’ve only seen the usual story, no trophies, and no nothing. And so many second places, in a championship made of three teams, really ridiculous. For the last 25 years our only boast and pride in Italy and abroad was just Francesco Totti. We only have him. Nothing else. Abroad people know AS Roma because there is Francesco Totti, not because there is Spalletti. The fact remains that once this is over, Totti will always be a legend in Rome and a legend of world football. Regardless. Spalletti, on the other hand, should instead continue to go around football pitches, to be appreciated, if he succeeds. Goodbye Luciano, always Forza Roma!”. “Lucas Biglia asked Francesco Totti for his jersey at the end of the match today. He’s defined him as a “phenomenal player”. An example of a gentleman fair play nearly as painful as losing 3-1. Our side instead saw Daniele De Rossi jeering the Lazio bench after scoring the equaliser from the penalty spot. Bottom line: be wise and wait until the end to be smart instead of doing silly things beforehand. Roma lost yet again another Derby. The players and the coach lost the plot again. Another slap in the face by Lazio and Simone Inzaghi. Humiliated on and off the pitch. Even with the referee “on our side”, for once. Bad mistakes in our favour and Lazio without key-players. Roma did their best to play one of the worst matches this season. Shameful. No hunger, no cohesion, no energy, not a team. No one to be saved today. Whatever had been built by now it’s been dismantled. Porto, Juventus, Lyon, Napoli and Lazio . Roma lost all the crucial matches. Out of scudetto race, out of Europa League, out of Coppa Italia. Now second place for Champions League is in real doubt, with Napoli only a point behind. Future is doubtful. All depends on securing second spot. It’s crucial. Then we will see what Monchi and the club will do, with the players and the coach. Spalletti defined the target as “Paradise”. Problem is the team has now gone back to hell”. “The dream is gone. The chase is over. Nearly and almost certain. Roma failed to beat Atalanta at home, while Juve picked up 3 easy points at Pescara. Now only virtual numbers separate Juventus from their 6th consecutive Scudetto. 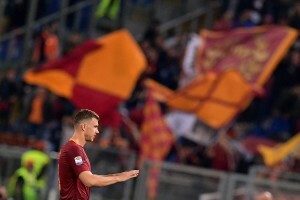 Roma must concede defeat, once again, and must now concentrate their final efforts to maintain second place in the league to qualify automatically for the next Champions League. No one to blame here. Really. They are known problems. Roma are still second to Juve for team quality, collective effort and mentality. Let alone the financial capabilities. The gap is there and will not be compensated until the American owners invest in those players who can bring that winning mentality to transmit to fellow teammates. Roma only got a draw against Atalanta for several reasons. You simply cannot afford to stay in the dressing rooms in the first half. Atalanta were by far the best team, intensity, pressing and movement all around the pitch. Roma appeared slow, sloppy and with the head somewhere else. Atalanta scored and could have scored another before the end of the first half. 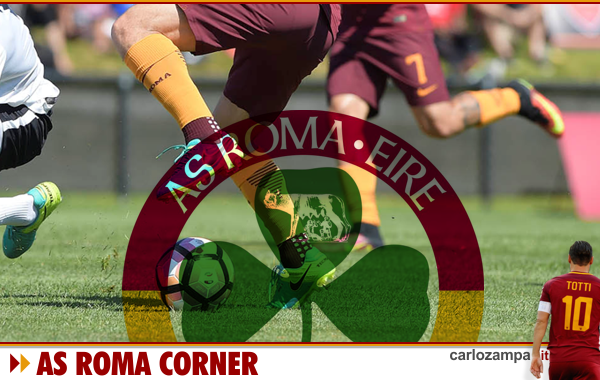 Roma reacted in the second half, came out and displayed what they can do, forcing Atalanta to surrender striaght into the second half, and by looking for the winner until the end. But it wasn’t to be. The crossbar and the post denied Nainggoland and De Rossi but it cannot be used as an excuse. At the end, the draw is a fair result. Roma are just not good enough to win the title. Yet. From now on, eyes on Napoli. We must keep the second spot or it will be a disaster for next season. At this stage, it would be fundamental to keep the concentration until the end. The coach surely realizes that. Then, we will do the maths at the end. As usual, always Forza Roma”. “We believed. We hoped. It wasn’t meant to be? Or weren’t just up for it? The Curva Sud back in the stands. Opposite is the Curva Nord in full swing. The elements of a great derby were all there, in theory. In practice, the stadium wasn’t full with only 44,000 fans attending last night. Both Curvas were full but what about the rest of the stadium? It was a Derby semifinal, second-leg; you wonder why many did not go. Perhaps, some Roma fans did not believe in a stunning comeback? Perhaps the outrageous ticket prices, the usual security restrictions, checkpoint hassle, parking miles away and so forth. Reality is many out there lost the unconditional, eternal passion for Roma that our fans were renowned for. Going to the stadium is no fun anymore. Some people go to watch the rugby instead, 6-Nations games has had an average of more than 60,000 attendances in recent years. It says it all. Whichever way, we cannot hail last that Rome City has returned to football splendour. It will be some time before that will happen gain. Perhaps with the new Stadium things will change for the better. Now, the painful part. Back to the match last night: Roma were to climb a mountain beginning from 0-2 deficits. Lazio had won the first match on the break, outpacing a sloppy Roma defense. Roma attacking force was confusing and predictable leaving the giallorossi trailing with zero goals scored. Last night we all knew Lazio would be waiting for the cat to play the mouse again on the counter, from their comfort zone area. Roma fell in the trap again, attacking with intensity but not defending well. When Dzeko missed an easy goal only after a couple of minutes we thought it would be another of those games. And when they eventually conceded on the break, it was the usual headache again. The rest of the match is not that exciting, despite Roma equalize, Lazio took the lead gain and it was game over, even with Roma scoring two more to finish winning the game 3-2. Highs and lows: Spalletti made mistakes with the initial lineup and by not “reading” the game. We all knew how Lazio would be playing, pity the coach didn’t or did not know how to handle it. Despite scoring two goals we think Salah was one of the worst on the pitch. Strootman failed to shine, Nainggolan looked deflated and no wonder, we add. He did not rest even against Empoli. Paredes is young but too shy, not able to take the team under his wing. Finally, Manolas had one of his worst games ever at Roma. Dzeko scored 32 goals but keeps missing the crucial ones. He was very nervous last night. Credit to Juan Jesus instead, the only one who kept composure at the back. Subs: Diego Perotti came on too late. Bruno Peres had better stayed on the bench. Terrible, terrible. Once again. Why Spalletti insist on him is a mystery. Last and final: Francesco Totti. He’s old, yes. He’s slower, yes. But look when he came on, in only 10 minutes he created what nobody else created in 80 mins, the only one capable to serve deep passes with one touch. He came on late as sub just in time to receive boos from the away fans. It’s not the first time. We cannot believe Spalletti is doing this on purpose; we want to refuse this theory. We know they don’t love each other but this is not fair to a player who is the history of this club. We have seen that Totti can still help the team in situations like last night. He should have been play for longer, Dzeko did not get a single ball passed upfront, and Totti would have been helpful that way. Next: Europa League gone; Coppa Italia gone; Serie A still second 6 points behind Juve. In theory we can still chase them, but the players look tired, deflated, it will be a very hard task. Second place also not so sure, Napoli still there threatening. The future of Roma is near, Spalletti, the stadium and the Sporting Director Monchi. Time is running out”. “Game with almost no story to tell of yesterday evening. Almost needless to talk about it, we all saw the result, and the poor opponents, although they had a few opportunities. Some amnesia incidents in defense but within the norm, considering the upcoming match against Lazio on Tuesday. Without much effort, we are to -5 from Juve, waiting for the match between Juventus and Napoli tonight. Last night we were just surprised by the few and late changes made by the Giallorossi coach. Nainggolan that is not replaced even on very quiet 2-0 advantage; Totti looked a bit rusty and not very responsive when he came on, we were not used to. Perhaps it was because he’s no longer’ used a lot, or maybe really it is the age that advances. Relentlessly. But mostly we want to talk about Luciano Spalletti. We said it yesterday. Everything must start from the Tuscan technician. The Club future plans and programmes, he asked for guarantees, clarity for the future. As we had hoped, we hope it is so clearly been made. But the fact that they were all silent to do with the renewal after the meeting between him and the leadership, the feeling is decidedly negative about it. Spalletti maybe is going to leave. If so, then it must ‘start from zero, with young players project, perhaps illustrious capital gains, hoping for a miracle Monchi, Sevilla type or even Atletico Madrid. If it were so it would be yet another American Revolution. 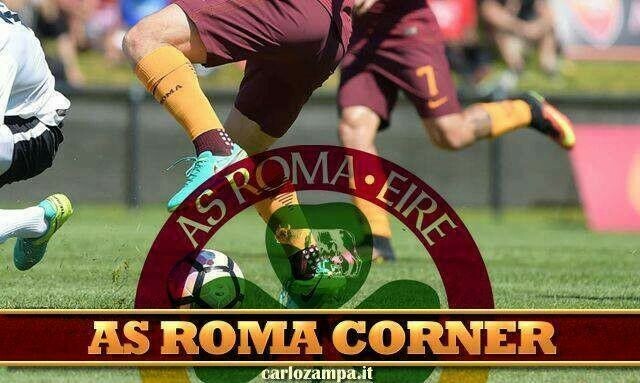 Whatever happens, we are Roma fans and we always hope the best for the club, the team and the city. But if it is only profit and no trophies then it would the usual failure. Yet, another. Meanwhile, eyes on the Derby on Tuesday, the semi-finals of the Italian Cup, a 0-2 reverse will not be ‘easy, but it is time to change the history of Roma football club, we need attempted comebacks that turn into business. We must do it this time! We are confident. Daje! C’mon Roma!”.